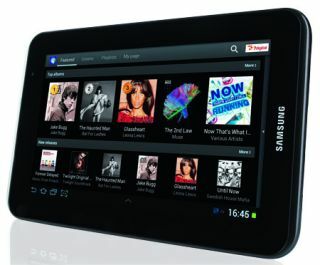 Samsung doubles its share of the tablet market as Apple slides | What Hi-Fi? Apple may still be king of the tablet market with the iPad, but Samsung is on the march, doubling its share in the final quarter of 2012. According to the latest figures from research company IDC, Samsung sold 7.9 million Android and Windows 8 tablets, up from 2.2 million a year ago, taking its share of the market for the quarter to 15.1%. That won't trouble Apple just yet, as the iPad maker still has 43.6% of the market – but that has dropped from 51.7%. It shipped 23 million iPads during the same period. Global shipments of tablets grew 75% in the last three months of 2012 to reach a record 52.5 million units. Earlier this week Apple unveiled a 128GB version of the iPad 4, due on sale in February. According to the IDC report, Asus saw its share slip from 7.8% to 5.8% despite strong shipments of its Google-branded Nexus 7 tablet. Microsoft entered the market with its Surface RT tablet, but failed to reach the top five after shipping just under 900,000 units. "There is no question that Microsoft is in the tablet race to compete for the long haul," says IDC's program manager Ryan Reith. "However, devices based on its new Windows 8 and Windows RT operating systems failed to gain much ground during their launch quarter, and reaction to the company's Surface RT tablet was muted at best."